This moving collection of reflections makes available to all of us the wisdom of the Congregation, which has done great things, continues to do them today, and, please God, will do them even better tomorrow! — Cardinal Theodore E. McCarrick, Archbishop Emeritus of the Archdiocese of Washington, D.C. The following three books from Ave Maria Press compile the daily reflections of Holy Cross priests and brothers. Their reflections, grounded in prayer and study, and drawing from the insights of founder Blessed Basil Moreau, C.S.C., document their personal stories and spiritual journeys to educate minds and hearts. This newly revised 2016 edition of The Cross, Our Only Hope offers more great daily meditations from the members of the Congregation of Holy Cross. Each daily reflection offers a unique perspective into spirituality of the Congregation. For additional background information, please visit our author's biography page. The Cross, Our Only Hope is a book of daily reflections in the Holy Cross Tradition: Members of the Congregation of Holy Cross, including current and past presidents of the University of Notre Dame, offer an introduction to the rich, vibrant spirituality of the Congregation through a series of daily meditations. The Gift of the Cross is a book on the Lenten Reflections in the Holy Cross Tradition: A collection of meditations on Holy Cross spirituality and apostolic activity. The Gift of Hope is an Advent and Christmas Reflections in the Holy Cross Tradition: An introduction to the themes of the Holy Cross spiritual tradition, and accessible Advent resource that offers a scripture verse and brief reflection for each day of Advent and the Christmas season. In addition to those listed above, the following books are also great resources for those wanting to learn more about the rich history of the Congregation of Holy Cross. 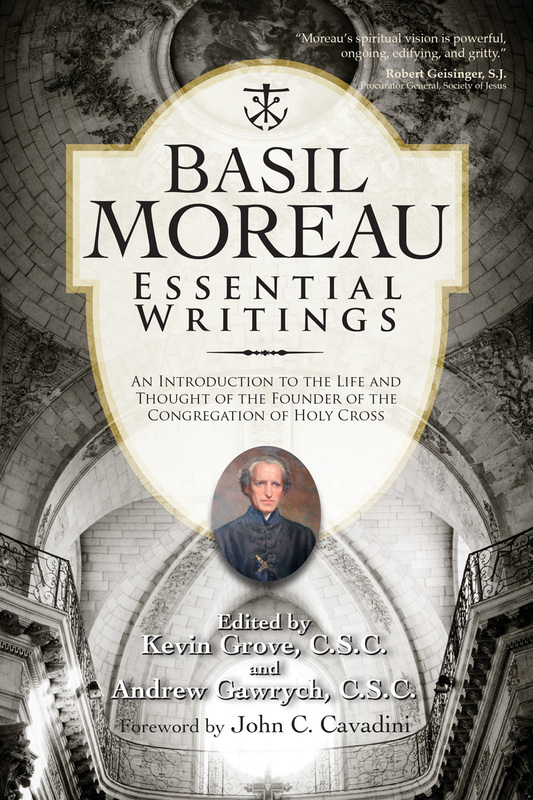 Basil Moreau Essential Writings is a comprehensive anthology of the most important and representative sermons, spiritual exercises and meditations, educational treatises, and circular letters of Blessed Basil Moreau, the founder of the Congregation of Holy Cross. This collection which includes material not previously published was edited by two Holy Cross Priests, Kevin Grove, C.S.C., and Andrew Gawrych, C.S.C. Basil Moreau Founder of Holy Cross is the story of the founder of the Congregation of Holy Cross. A story of war, persecution, controversy and sacrifice comes to life in this biography written by popular Catholic journalist Gary MacEoin. Brother André tells the extraordinary story of the recently canonized St. André Bessette, lauded by St. John Paul II as "a man of prayer and a friend of the poor." Beloved for his kindness to the sick, and his devotion to St. Joseph, this book tells the extraordinary story of this unassuming but saintly man. In continuous operation since its founding by Fr. Edward Sorin, C.S.C., in 1865, Ave Maria Press is owned and operated by the United States Province, and is a leading publisher of Catholic high school religion textbooks, parish resources, and books on Catholic prayer and spirituality.